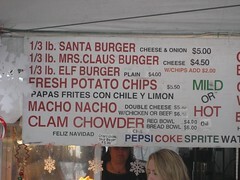 The holidays are in full effect. This weekend we went to see a performance of “A Christmas Carol” in a theater near Union Square, and it was really a good time and a good show. Our one complaint was that there was only one person working the bar at intermission, so we couldn’t have a glass of wine. We remedied that by going out to dinner at 1550 Hyde (finally! ), which had a delicious and well-priced prix fixe, and where K. had a flight of sauvignon blanc and I tried the recommended wine pairings with my meal. Very tasty. Eating in San Francisco is good. This entire week has been a whirlwind. We had a big holiday office party Thursday, which was extremely successful — in fact, 10 times the number of people who actually work in my office showed up. At home, we’ve managed to entertain friends on two separate evenings in one week, fairly successfully, I think. And, of course, we’re prepping for our trip to New York tomorrow. 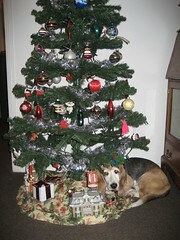 Haylee looks very sweet under the tree in this photo, but, of course, most of the time she tries that trick she knocks down ornaments and fake branches when she gets up. But that’s better than Tex, who’s been eating any low-hanging ornaments made with felt or fabric. Ho ho ho! Last night’s trip to Boulevard was great. We had a fantastic time. We had some champagne, we had some wine, we had some fancy appetizers and tasty entrees, we had a yummy cheese course and a couple of over the top desserts that had little white chocolate signs on them that said “Happy Anniversary.” Our wallets got significantly lighter. A woman complimented K.’s dress. A well-dressed gentlemen told me I had a great scarf. We people watched — an older woman who sat in the bar by herself did crossword puzzles in the newspaper and ordered the $44 lamb chops; the May-December couple next to us paid in cash, and spent less than we did. The only downside to the evening happened before we left the house, when I broke my beloved Screwpull wine opener trying to get a solid synthetic “cork” out of a bottle of wine. Damn those plastic corks! If real cork isn’t the answer, I say go the screw-off route. I may be able to salvage the Screwpull, if the Crazy Glue holds. 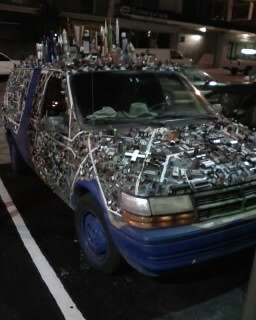 Texas art car spotting in the Tenderloin. 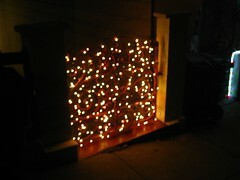 Yep, a couple of nights ago the spirit of the season got to us, and we wrapped our gate in lights. Our neighbors inspired us — the two houses next to us have really got the decorations going on. We’ve got our tree up and lit too, although we still need to decorate that. It’s the cheapo fake tree we bought at Target a few years back; one of the best 20 bucks I ever spent. Or, actually, it might have been 10. I’ve been listening to a lot of Christmas music on XM radio, because they started their five Christmas music stations up around Thanksgiving; I’ve also tried out their newest offering, Radio Hanukkah. Last weekend we toured a Christmas fair in San Jose, went to a Holiday Tea at the King George Hotel, and checked out the holiday themed windows at Macy’s (which have real live animals in them, by the way). This weekend we’re going to see a Trannyshack production of two Christmas-themed “Golden Girls” episodes, and we have holiday parties as well. Next weekend, we’re going to see “A Christmas Carol” performed. We’re up to our ears in the holiday! We’ve really got to get our Christmas shopping kicked off, though. 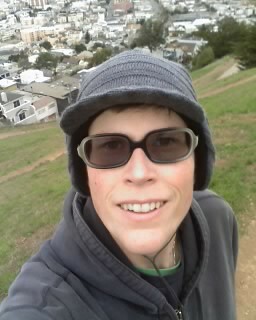 It’s a chilly day on Bernal Hill.